I love allll that cellulite..said NO ONE ever! Because we CANT live our entire lives in a coverup... we now have PERSPIRE Fit Wraps! Our Perspire FitWraps are a great addition to your weight loss regimen! They are fabulous for combating that unsightly cellulite that tends to creep up on the best of us and they are even great for shaving off that extra stubborn body fat that just doesn’t want to GO! Read more of the benefits and how they work below. All of our wraps include a relaxing 30 minute session in our full spectrum infrared sauna as you relax in your PERSPIRE body wrap.... Our sauna produces far, near and mid infrared heat, which is light we can’t see, but can feel as heat. All warm blooded animals (and humans), generate this type of heat naturally to warm themselves, and more than half of the sun’s heat is infrared as well. Infrared heat warms us without warming the air around us and penetrates our bodies, rather than only heating the skin. Our Infrared body wraps are known to help with a wide range of therapeutic benefits. Here are a few listed below! 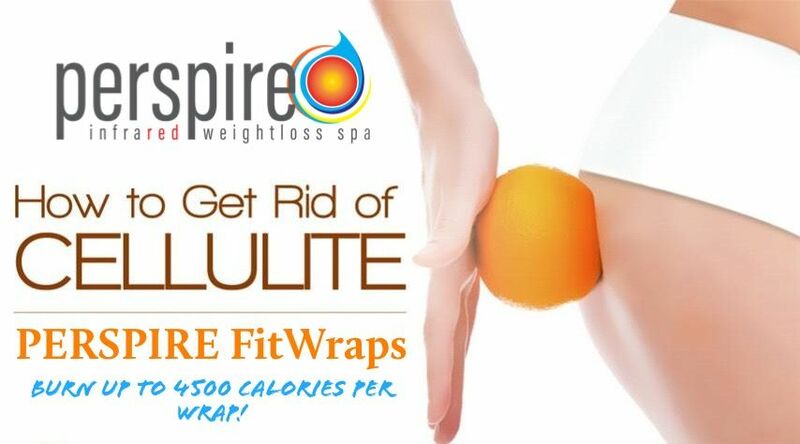 Calorie Burn: One of the most popular benefits of infrared heat therapy & our PERSPIRE body wraps is weight loss. Extensive clinical research has documented a wide range of benefits supporting weight loss using this type of wrap/heat therapy. Sweating consumes calories and a PERSPIRE FitWrap can induce 3-5 times more sweat than exercise alone. Our PERSPIRE Fit Wraps and Infrared therapy can rebalance metabolism directly speeding up the rate calories are burned even after a session. As organic acids and toxins are purged your fasting insulin levels may drop toward normal, this can assist with stopping your body from being pushed to store carbs as fat. Fat becomes water-soluble at a body temperature of approximately 100.5 degrees F and can “melt” by breaking up into smaller particles, which can then be purged from the body through infrared induced sweating. Through studies on infrared, it has been discovered that infrared can help the appearance of cellulite through its ability to help rebuild collagen connective tissue. Stronger collagen can help rearrange the fat deposits away from each other and the skin’s surface, and help prevent further accumulation of cellulite.